Another day, another terrific newspaper image of Houdini that I've never seen before. This one comes from The Times-Picayune/Nola.com website which has a nice article by James Karst about Houdini's visit to New Orleans 100 years ago this week. On February 23, 1916, Houdini performed a suspended straitjacket escape from the fifth floor of The Daily States building on Canal Street. It's interesting to read that a net was stretched out below Houdini and that a jazz band played "Brownskin, Who You For?" during the escape. This is the first I've ever heard of Houdini using a safety net or music being played during an outdoor stunt. The article also refers to the straitjacket as being white -- which would also be a first -- but looking at the image above, it appears to be the same brown jacket Houdini used for so many of his suspended escapes. 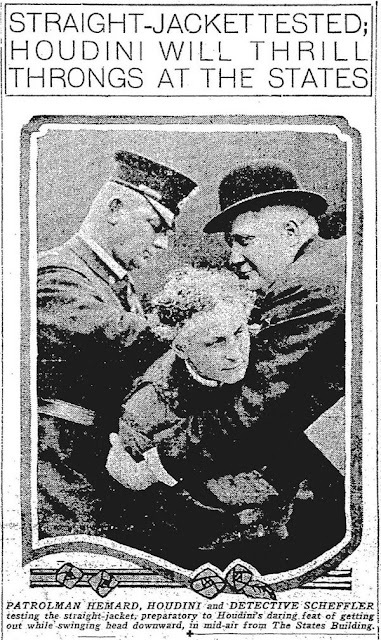 Click to read the full article: "Houdini escaped from straitjacket high above Canal Street" at Nola.com.